The Shinola Henry Ford pocket watch is a breath of fresh air in a watch world dominated by smart watches and the like, it’s modern yet classical, it’s simple yet sophisticated and I want one! The Henry Ford pocket watch is the first in Shinola’s stable and it draws inspiration from the landmark American innovators of our time. Case: Stainless steel, with single curve sapphire crystal. Dial: Super-LumiNova hands and indices. Movement: Shinola Detroit-built Argonite 1069 quartz movement, hand-assembled from over 40 Swiss-made components. Watch Chain: Stainless Steel ID link chain with clip. 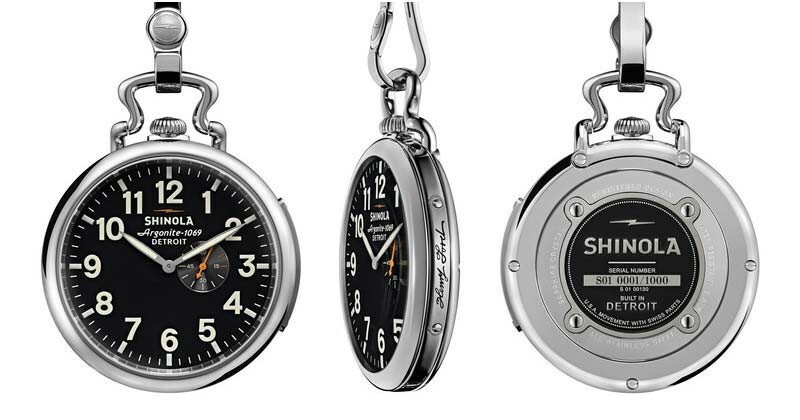 Shinola Pocket Watches : Henry Ford Pocket Watch 0 out of 5 based on 0 ratings. 0 user reviews.